Interview with Steven Strait, star of 10,000 B.C. Steven Strait stars in the thrilling and action-packed epic 10,000 B.C., directed by Roland Emmerich, as D'Leh, a who mammoth hunter who goes on a long journey to rescue his love, Evolet (Camilla Belle) from the hands of warlords. 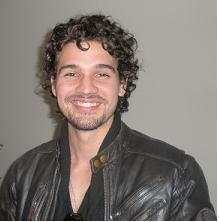 Steven Strait has previously been in The Covenant, Undiscovered and Sky High, his big-screen debut. He has also been a singer for the band Tribe as well as a fashion model. He will be starring in the upcoming movie Stop Loss. I had the privilege to interview him. 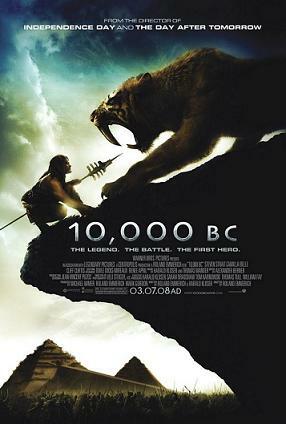 Warner Bros. Pictures releases 10,000 B.C. nationwide on March 7th, 2008. NYC MOVIE GURU: What attracted you to the role of D’Leh? SS: Roland [Emmerich], first and foremost. I’m of the generation that grew up with his films. I saw Stargate when I was 9-years-old. I read the script and thought it was incredibly original. Essentially, it’s a love story that has all this action and adventure around it. NYC MOVIE GURU: How did you prepare for the role? SS: I grew up doing martial arts and I boxed for many years. So, dropping weight and gaining weight was actually something that I was familiar with. I had lost at least 30 or 40 pounds before pre-production. Then we did the boot camp to bring everyone together. Some of the shoots in the film [were] way harder than any preparations that we did. That mammoth sequence took weeks to shoot. We were really running through the tundra there. NYC MOVIE GURU: How did it feel to act in a movie with so many special effects? SS: Initially, I felt a little silly. I’m out in the middle of the desert poking and prodding at air in front of 300 people. Once I got into the rhythm of it, I just let my imagination, kind of, go because there’s no constraints on what I’m acting with. For the first time in 10,000 B.C., we shot everything on location, so there wasn’t all that much blue screen. We just plugged [the special effects] in during post-[production]. It was liberating in a very strange way. NYC MOVIE GURU: How long did the hair and makeup process take for you? SS: It was about two or three hours of hair and makeup every morning. Putting on the clothes took about an hour, so it was pretty extensive. NYC MOVIE GURU: How did you feel being around director Roland Emmerich? SS: I was never intimidated by [him]. Not only is he sweet, but a great guy and open [as well] He’s not locked into his own way of thinking. We all contributed ideas. It really was a communal project because everything had to be made from scratch. There were no templates for these sorts of things. Initially, it was a little daunting just because of the scope of it. I never did anything this large before by far. Tackling the project and the character and making it believable was a little anxiety-causing. On the first day, Roland completely defused that. We shot the film, pretty much, in sequence from beginning to end, which is incredibly rare. NYC MOVIE GURU: What locations did you enjoy the most? SS: They were all amazing. In New Zealand, it was in the dead of winter, so it was pretty cold, but being up in the mountains was pretty beautiful. We’d joke with Roland [Emmerich] because we’d look at some of the shots that we were getting and [said], “Nobody’s going to be believe that this is real.” I can’t imagine that the locations that we were shooting in were all that different in 10,000 B.C. There were no roads to the places we were and there was no civilization for thousands of miles. At the end of the film, Namibia was where the experience of all of us as actors and as people was coming to an end and also for the characters that we were playing. Those things coming together all at once was the most memorable part. NYC MOVIE GURU: What did you do after all the filming was finally over? SS: I got back to Los Angeles and, basically, left my phone in L.A., got in my car and just drove up north for, like, a month. I just chilled out and tried to digest everything. I was waiting in line at Starbucks to get a cup of coffee and I realized that, [the day before], I was on a dune in Namibia with a bunch of guys with leather on and there’s a pyramid involved. It’s a little shell-shocking. Half my self-tanner was melting off my face and people are looking at me like I’m a crazy person. It took 5 or 6 months off until Stop Loss.